In Library War, a woman fights the warriors of censorship while also hunting for her mysterious prince among library fighters. In “Library War,” the Japanese government passed the Media Betterment Act, which allows the government to censor books, magazines, films, and other forms of media for content it considers unacceptable. The Media Betterment Committee enforces this censorship, taking these offensive materials from places like bookstores and disposing of them. But in a move that speaks either of genius or madness, the government also passed the Library Freedom Act, allowing libraries to become safe repositories for even banned materials—places where people can go to find any available media, approved or banned. Several years before this story begins, conflict between the libraries and the Media Betterment Committee turned deadly during the event that became known as the Nightmare of Hino. Betterment forces attacked library workers and ended up killing 12 people. After that, libraries began to arm themselves and train people in military fashion for times when they are required to fight Betterment soldiers. Iku Kasahara has joined the Library Force at the Kanto library for two reasons. First, she’s a great reader and doesn’t like censorship. Second, she has a crush on the man who once protected her when Betterment tried to take an offensive book away from her, though she can’t remember much about him. Despite how that first part might read, this series keeps a fairly light tone, though shows some intense moments toward the end. There are a few fights between the Betterment and Library forces, but they stay at about the level of The A-Team—lots of shooting, but rarely does anyone get seriously hurt. The rules of conflict between the two forces can seem rather odd, especially since they aren’t well-defined in the series. For example, Iku and another member of her library force are fleeing from an ambush by Betterment forces. She calls out the Betterment members for using firearms in a place where it was illegal for either side to use them. Another time, it’s pointed out that Library Forces can only shoot on library property. And despite the two sides being in bitter conflict with each other, that doesn’t do much to impede their everyday lives. Library members still shop, eat out, go to cafes, and do so without being armed. The evening before the final big fight of the series, a member of the Library Forces encounters someone with the Betterment Forces at a grocery store, and they walk and chat in a not-unfriendly manner before parting to return to their respective groups and prepare for the conflict coming in the morning. A series about a government attempt at censorship is sure to raise some emotions in viewers, even a series as mostly lighthearted as this one. Library War isn’t subtle about which side it takes: the libraries are the good guys and the Betterment people are not. In fact, Library War appears at one point in the series on a list of controversial books that one organization, which is possibly connected with Betterment, is concerned about. Later, Betterment tries to take a book called The Prophecy from librarians transporting it from one place to another. Here, one library worker describes this book in terms that clearly reference Fahrenheit 451. I’m against censorship, and at least try to follow Evelyn Beatrice Hall’s quote, “I wholly disapprove of what you say and will defend to the death your right to say it.”1 On the other hand, the self-congratulatory attitude of much of the “Read banned books” paraphernalia I’ve seen is also nausea-inducing. Freedoms are always difficult things. For example, freedom of speech is good. But that freedom also allows telemarketers to bother us at dinner time, politicians to make promises during campaign seasons that we all know they will never keep, faith healers to claim that God told them something completely loony, and basically for people to disagree with anything anyone else says or thinks. We don’t live in a perfect world, and we are not perfect people. Every good gift comes from God, but we’ve abused those gifts countless of times over, and freedom of speech and expression is among those gifts that has often been abused. Still, that gift remains precious and valuable. Given that fallen state of all mankind, even and especially of those in charge of any society, even if censorship could be defended, if it were implemented it would likely only result in the banning of the good while letting the evil run rampant. On a scale of 5, I’ve give “Library War” a 3.5. It’s above average and enjoyable, while also dealing with some serious issues at times, but the overall light feel tones down what could have been a serious look at the problems of censorship. Still, it a good series, and I can recommend it. 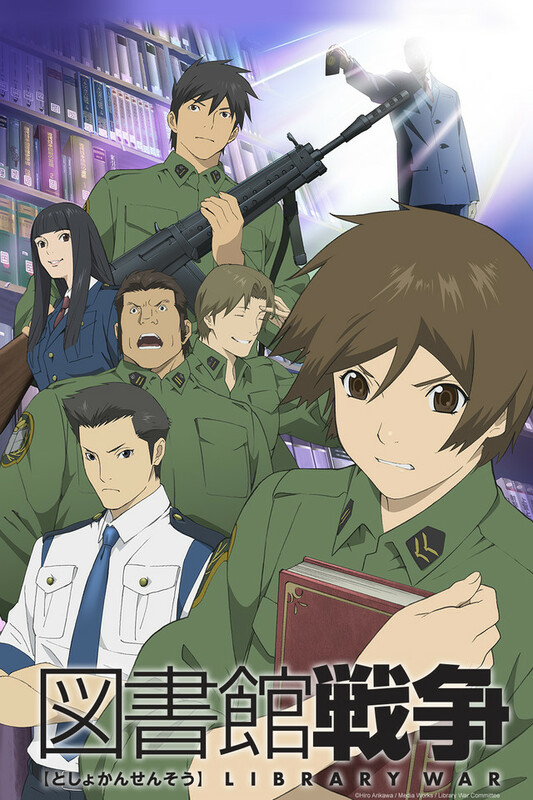 The anime series is based on a manga series, Library Wars: Love and War, and that title reflects how the anime series goes. It has a pretty good balance of both the war aspect, and the romance, too. I’d guess there could be some confusion about the name. Crunchyroll calls the series Library War, while the manga is Library Wars. I remember seeing that the Japanese language doesn’t have plural forms of words like English does, so that may explain the difference in the names. The anime has 12 episodes on Crunchyroll, with a 13 being an OVA that focuses on Dojo’s friend Komaki. The manga has 15 books, which likely means there’s more story should there be another season or two for the anime, though I don’t know if a further season is planned. There is not a further season of Library War planned, because there is a movie sequel to the anime. The sequel is called Library War: Wings of Revolution. I have yet to find it on DVD or released anywhere in the US. Though *cough* if you know where to look, it can be found. The anime covers the first 11 (I think) volumes of the manga, and the movie sequel covers manga volumes 12-15, though the very ending conflict (while still ending the same manner for the same people involved) plays out differently. The manga is actually an adaptation of four novels written by Hiro Arikawa. The episode with the reference to Farenheit 451 is all made up for the anime, and the further relationship between Komaki and the MBC guy is sadly not in the manga, either. However, the ending with the ‘agnosia’ issue with Dojo was also completely made up – the fire incident did happen in the manga, but with a completely different person, and it honestly played out better that way. Even when I saw the anime before reading the manga, I thought that whole thing was contrived for drama, and was relieved to see I was right when I did read the manga. The conflict rules are pretty glossed over in the anime, but are covered better in the manga. Essentially, the Library Defense Force is not allowed to do battle outside of library property (or, in the case of the museum exhibit, where they’ve been asked to provide security). The Media Betterment Forces have to notify them before initiating battle, so that members of the public have time to evacuate safely and not be in harm’s way. To fight in public areas, both the LDF and the MBC are required to get permission from the Ministry of Justice beforehand, but of course that bias is skewed so far it’s not even funny, since the Library Defense Forces are managed by local governments (like cities/municipalities), and the Media Betterment Forces are managed by the national government. It’s unclear whether the Library Defense Act was something recognized at the national government level, or just adopted by the local governments, and they self-regulate themselves, essentially. In American terms, the LDF is basically a militia. Additionally, there are also three live action movie adaptations of Library War (a series). They are: Library War, Library War: Book of Memories, and Library War: The Last Mission. The first and third can be found on DVD/Bluray in the US, but Book of Memories was a made-for-TV special in Japan and as far as I can tell has not been released anywhere with Region 1 coding, or with English subtitles. There are fan-made subtitles available, though. Thanks of clarifying things, Rebekah Loper. I wondered if that was worth looking at on Crunchyroll, but you seem to have confirmed my assessment that it’s more gimmick than substance. And I don’t know if this counts as a balancing Happy Nice Time anime review, because half-hearting a topic like censorship seems neither Happy nor Nice of a time. Also where’s my Natsume Yuujin-cho review Burnett I want an excuse to gush about Nyanko-sensei. Well, it’s not Psycho-Pass, I’ll admit that. But there is substance to it, too.